On his famous 1941 speech that went down in history as the Four Freedom speech, the then President of the United States of America Franklin Delano Roosevelt declared that the world to come should have been built upon four fundamental freedoms, among which he included Freedom from want. Freedom from want is a general concept, later also recognised in the Article 25 of the Universal Declaration of Human Rights, where want is generally considered in terms of food, clothing and housing. The right to be free from hunger is therefore one of the three essential components of the Rooseveltian appeal to freedom from want. 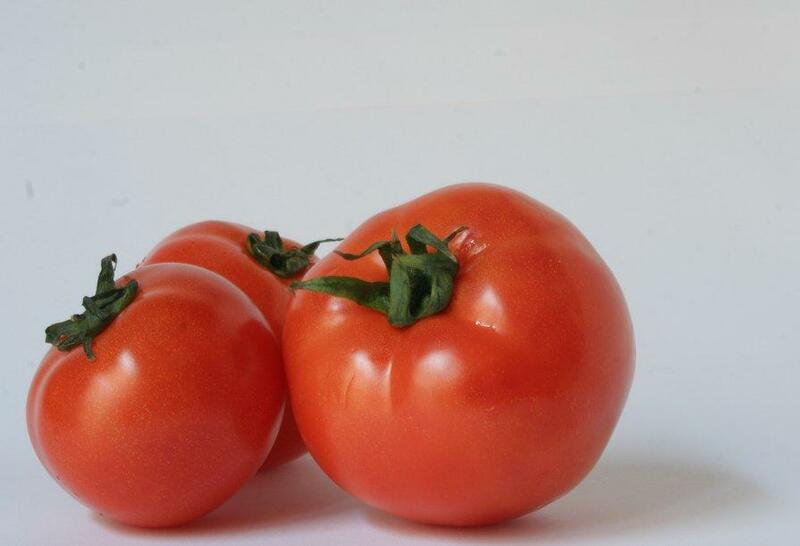 In brief, a person is not free from want if cannot eat properly due to lack of economic resources, if cannot afford an adequate quantity and quality of food to maintain a nutritionally acceptable diet. The general public, especially the Western middle classes or the economic elites are used to believe that hunger is a third-world-specific problem and their immediate association of ideas goes to children in Africa or women in India. It is not frequent to read in the popular press the extent of food poverty among our fellow citizens and possible policy action in this respect. However, in high-income Europe, freedom from hunger is not yet a general achievement and still touches, often with scarring consequences, the lives of many. 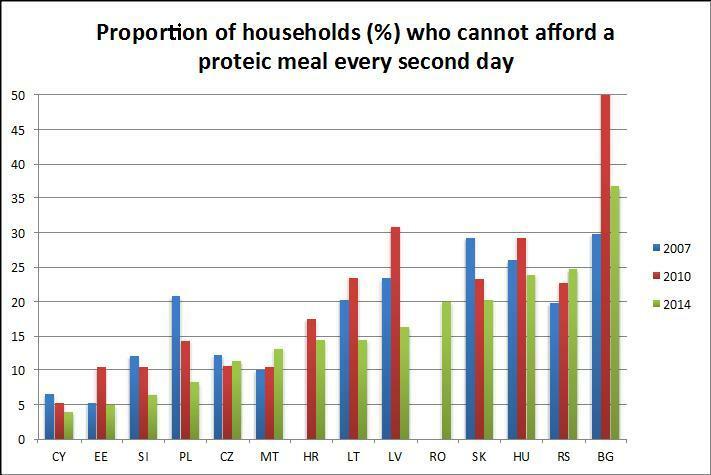 A European survey (the European Survey on Income and Living Condition) that collects information on social exclusion asks European households across Europe if they can afford a high-protein meal with meat, chicken, fish or vegetarian equivalent every second day. This survey tends to underestimate this phenomenon, as, by design, it does not reach homeless persons who are the most likely to suffer the hunger pains. However the figures derived from EU-SILC illustrate the general evolution of the freedom from hunger when measures as above. 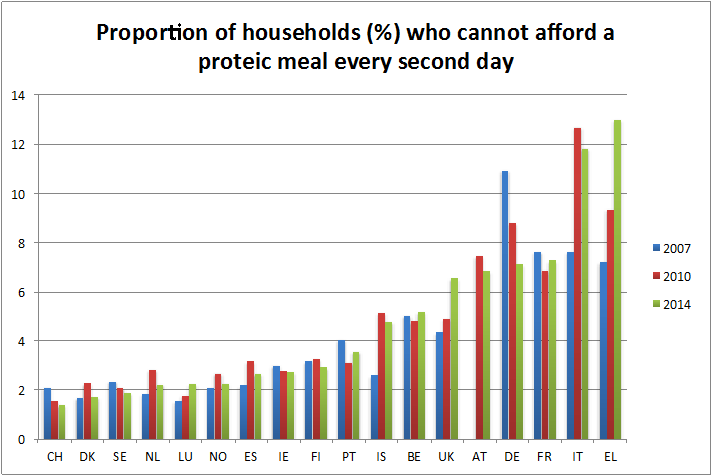 Figures flag that too many households cannot still afford high-protein meals – whose lack is here used as an approximation of lack of a nutritionally acceptable diet – also in affluent Europe. As shown in the next Figure, the proportion of household in condition of food poverty changes dramatically across countries: while in very wealthy countries such as Switzerland or Luxembourg, the proportion of households in food poverty is close to 2% – even decreasing for Switzerland – in Southern-Mediterranean countries such as Greece or Italy, the phenomenon is alarming and stands well over 12% in recent years. Not only the proportion of household in food poverty is deeply disturbing in many countries, it appears an alarming phenomenon on the rise, albeit heterogeneously across countries (for instance in Italy, Greece or the UK the 2014 food poverty level is well over the pre-crisis level; conversely in Germany the proportion of household who cannot afford a protein meal has decreased). In medium-income countries such as those which joined the European Union relatively recently and Serbia the situation is gloomier. The proportion of household experience a form of food poverty is of a greater order of magnitude, on average three times higher than in their western neighbours of EU-15 + EFTA. As illustrated in the next Chart, these levels are consistently higher than in the EU-15 while the trends over time regarding household in such hardship are rather heterogeneous. Households in Poland are experiencing an improvement on average as the proportion in food poverty is visibly declining (from over 20% to less than 10%) and similarly in Baltic countries such as Latvia and Lithuania. Conversely, the situation appears bleaker in countries such as Romania, Hungary, Serbia or Bulgaria in which the proportion of households in such a condition is both high and persistent over time. This evidence serves to show that lack of basic food is a harsh reality for many households also in affluent Europe and does not seem on the verge of disappearing over time. It is therefore surprising how little attention it gains in the national political discourses. The ancient call of Franklin Delano Roosevelt to free the world from want, which is clearly alive for the developing world, is no less obsolete also for European countries: if the freedom from hunger is a public goal, essential to realise the freedom from want, it has to be achieved by generating attention around this issue and proposing political options at both the national or, in the case of the EU, the international level.